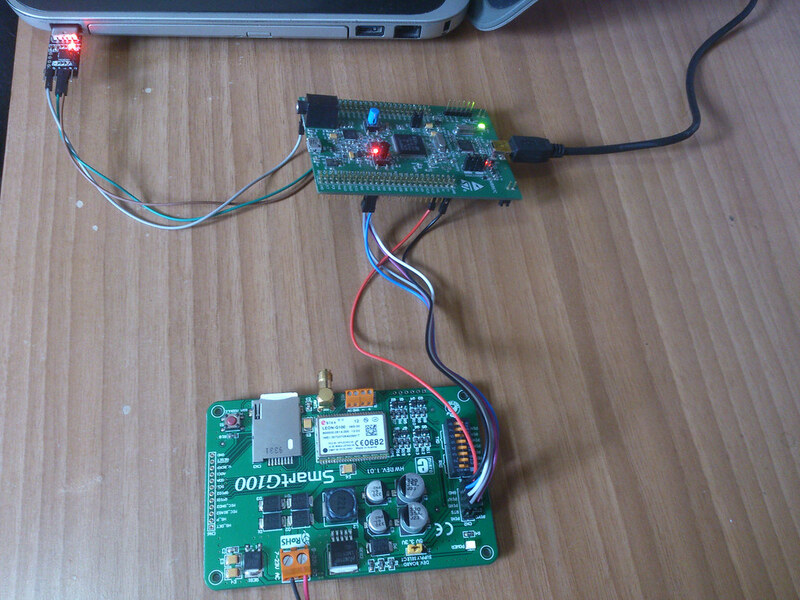 NuttX has PPP support to GSM/3G modems, then I decided to test it with UBlox Leon-G100 modem. As you can see on my previous post I was testing the SmartG100 board on Linux to verify if GSM modem is working, because it is working I can follow with NuttX test. Looking at PC15 position (0x08002c30) at System.map file I noticed it was crashing at “strlen” function. Immediately the pap_username and pap_password variables came to my mind. But the compiler said it don’t know about pap_username and pap_password, after inspecting “apps/include/netutils/pppd.h” I noticed it depends on NETUTILS_PPPD_PAP to include them to struct. Then I enabled the “PPP PAP Authentication Support” in the NuttX menu config. Thank you for your nice post.. I have got this up and running but the problem is that the pppd app has taken over the nsh shell. How do you configure the app to release the nsh? I am fighting this same issue. I supposed everything was fine and today when I create a connection to traccar server to send tracking positions I got stuck with this issue. I can transmit few packages putting a delay after connect() and before send() and increasing the AHDLC_TX_OFFLINE to 500 ou even put it as 0 (never timeout until the int overflow). I found an ugly workaround, but it is working! Yes! the workaround around is working. My connection seems to be solid with a delay of approx. 800 ms. These configuration is not there in nuttx, so how to do this. These CONFIG_ are dependent from other configurations be enabled, just like it work in the Linux kernel as well. i getting one problem in that after few sec it is getting disconnect and again it is trying to connect. We did as per your instructions,and we are connected with PPPD.But not able to ping any ip addrss,its getting connection timed out.As well as we are not able to get the dr adress in ifconfig. Manualy i tried to change its getiing same issue. I think it is caused by some configuration missing. Could you please subscribe to NuttX google group and post it there, then more people could help to solve this issue. Please send an email with more information as you can share.